The Louisiana rooted, Los Angeles based, Mudbug Brass Band is dedicated to the "Second Line" tradition of the Crescent City, drawing from New Orleans traditional Jazz, R&B, Funk & Mardi Gras. In 2011, three Louisiana natives, whose sole purpose was to entertain crowds throughout Southern California, formed this 8-piece brass ensemble. Since then, Los Angeles Magazine has hailed them as a "Must-See LA Show” in 2014 and a "Can't Be Missed" band for the 2015 Make Music Pasadena Festival! They've made the "Best of LA" list for KCBS: Los Angeles four years running and the "Don't Miss List" of LA Downtown News when they performed for the "Metro Presents" Concert Series and LA Phil’s 100th Anniversary with CicLAvia. Whether on the stage or in the streets, Mudbug has participated in many high-profile events including the wrap party for "The Voice", the reopening of Pauley Pavilion and the Culver City Centennial Ball. They have appeared on ESPN Sportscenter: Los Angeles and VH1’s Martha & Snoop’s Potluck Dinner Party. They have worked for Hollywood icons like, Gwyneth Paltrow, Vanessa Hudgens, Mel Brooks and Tina Knowles-Lawson. Headline performances include the Long Beach Crawfish Festival, Levitt Pavilion's Free Summer Concert Series and Wanderlust Festival on the Santa Monica Pier. The Los Angeles Times featured Mudbug when they led the "Walk the Talk" Parade through skid row in Downtown LA. Currently, Mudbug is supporting their single, "Slick and Sleazy," which was recorded and mixed by Charley Pollard at Dragonfly Creek Studio in Malibu, CA. With an authentic Second Line vibe, "Slick and Sleazy" explores the Louisiana heritage of the group. It was preceded in 2017 by "My People,” an R&B/Funk song with a message of friendship through times of trouble and trial. My People” was called "Uplifting" by No Depression Journal of Roots Music and was featured on WWFM's Block Party Radio with Kim Scott in New Jersey. Their first single, “Are you with me,” was self-produced as an anthem joining everyone together through social awareness. "Are you with me" received radio airplay on 22 FM stations across the US and digital airplay on Music Choice in New York City. The Mudbug Brass Band is proud to have followed in the footsteps of fellow New Orleans musicians by spending their Sunday afternoons playing residencies at restaurants and their Friday nights playing Taverns and Saloons. They have performed for the LSU So Cal Alumni Crawfish Boil since 2014 and the Venice Beach Mardi Gras Parade since 2011. They have supported causes like the Motion Picture Television Fund, Champion for Children's Benefit and Hollywood Community Housing as well as corporations like YouTube, Google, Sprint and Sierra Nevada. With over 250 appearances to date, The Mudbug Brass Band is well seasoned, but only getting started! They will continue to spread the musical culture of New Orleans to Southern California from the studio and the stage. Actor Jeff Goldblum with The Mildred Snitzer Orchestra, Dustbowl Revival and The Mudbug Brass Band are converging with many others to celebrate the Los Angeles Philharmonic’s centennial season. The event, formed from a partnership between CicLAvia, Community Arts Resources and the LA Phil, clears the roads of cars for a free eight-mile long party stretching from downtown’s Walt Disney Concert Hall to the Hollywood Bowl. Attendees of the Wearable Art Gala were honoring Beyoncé and her mother-in-law Gloria Carter for their humanitarian work and donated via an art auction to the Where Art Can Occur (WACO) Theater Center in North Hollywood — founded by Beyoncé’s mother Tina Knowles Lawson and Richard Lawson…It was truly a family affair. Zebra-print rugs decorated the wood floor, while glamorous chandeliers hung above. Guests were entertained by an aerial silk dancer, the upbeat Mudbug Brass Band and a person on stilts in a lion costume. With the arrival of spring, it's time to shelve the chilly, moody soundtracks of winter and celebrate the return of sunshine. As if fulfilling public requests, the Mudbug Brass Band have released a kicking, sweltering single in "My People," the kind of soulful boogie that will inspire shirts to be tossed off and beer cans opened. Those who miss the Red Hot Chili Peppers before they became too serious will find much to savor here as the Mudbug Brass Band generate a similar kind of heat albeit less sexual and more loving, echoing the uplifting vibe of Bob Marley and Sly and the Family Stone. The Mudbug Brass Band are decidedly retro; "My People" jumps with the invigorating energy of '70s soul. The urgent, sweaty bass lines and funky riffs smoke the dance floor. With so much racial division and political unrest throughout the world, the group decides to throw a party of unification; bless their hearts for that. With an electrifying horn section that recalls the Tower of Power, the Mudbug Brass Band stitches together its jazz and vintage R&B influences for a crackling good time that demands repeated spins. Expect big, vibrant sounds from The Mudbug Brass Band! 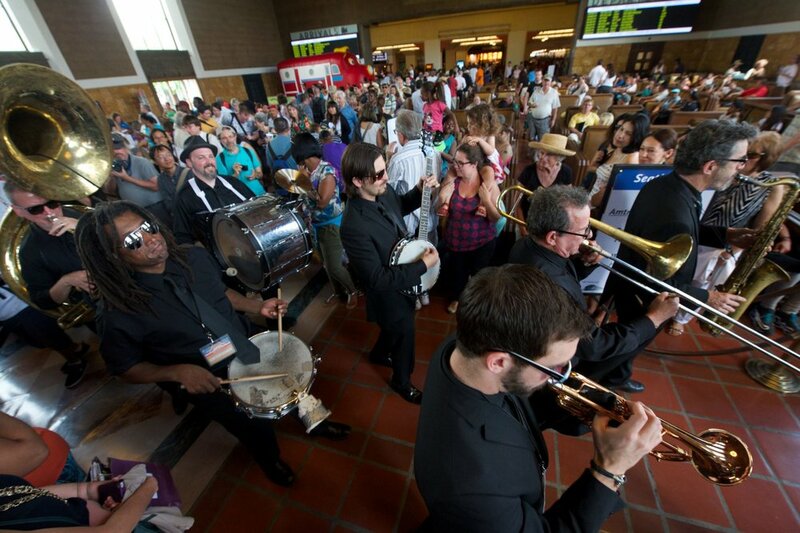 L.A. favorite, The Mudbug Brass Band, takes over the halls of Union Station to celebrate Fat Tuesday with a traditional Second Line Procession starting at the station’s East Portal. The 8-piece New Orleans jazz band will make their way to the Grand Waiting Room in this free performance event. Laissez les bon temps rouler! New Orleans comes to L.A. for a family-centric Mardi Gras celebration at Runway Playa Vista with the eight-piece Mudbug Brass Band! With the new uplifting single, "My People," the L.A.-based Mudbug Brass Band unpack the spirit of New Orleans in Southern California. Brewing an exhilarating blend of '70s funk, soul, and jazz, the Mudbug Brass Band have the instrumental chops and infectious songwriting to be the next Red Hot Chili Peppers, one powered with killer horns. We've officially found the most entertaining wedding ever. Hands down. The Mudbug Brass Band, stilt walkers, a magician, and a cigar roller all made an appearance at this insanely gorgeous and spectacular wedding, brought to life by COJ Events. After a non-traditional ceremony that included all 250 guests forming a large circle around the couple, The Mudbug Brass band and stilt walkers led the guests from the ceremony to cocktails. A magician entertained guests at cocktails, and as they sat for dinner, a cigar roller kept the non-dancers happy later in the night! The Mudbug Brass Band gets the good times rolling in L.A., bringing the second-line sound of the Big Easy to this free outdoor concert at Levitt Pavilion. Formed by a trio of Crescent City natives, this eight-piece L.A.-based ensemble melds traditional jazz, funk, R&B and Mardi Gras music into a spicy New Orleans mix, with a side of social awareness. Their latest single, "My People," follows up on their community anthem "Are You With Me?" song and video. This popular group has also appeared at celebrations and festivals all over the Southland, including the Long Beach Crawfish Festival and at the wrap party for The Voice. All the best things to do in Los Angeles, California, include The Mudbug Brass Band at Vibrato Grill & Jazz! Los Angeles’ favorite Mardi Gras celebration is back again for their 28th straight year! The world-famous Farmers Market is pulling out all the stops in its quest to put on one of the largest Mardi Gras festivals in the L.A. region. In a three-day, family-friendly celebration, revelers will be treated to live music, arts and crafts, roving New Orleans-style bands and some of the best selections of gut-filling meals west of the muddy Mississippi. The event will also feature the finest New Orleans and Zydeco music, a strolling parade with The Mudbug Brass Band, as well as activities for kids, bead-throwing, and much more! The fun doesn’t stop on Repeal Day at Del Monte's Speakeasy until Midnight with the Mudbug Brass Band's Procession! November 28, 2016, marked fifty years since the Los Angeles Zoo and Botanical Gardens opened its gates in Griffith Park. The party was on! The zoo wouldn’t open until ten that morning. But we’ve never had more fun standing in line. Topnotch musicians The Mudbug Brass Band struck up an uptempo Dixieland selection demonstrating their expertise on songs like “Sweet Georgia Brown”. Love The Mudbug Brass Band! The Mudbug Brass Band gave our office a proper New Orleans sound for a New Orleans guy on the occasion of his 50th trip around the sun. This band was legit! Celebrate Easter at the Italian-inspired Mr. C Beverly Hills hotel with a festive Venetian-style buffet brunch available poolside and at The Restaurant at Mr. C. Guests can listen to music by the Mudbug Brass Band. With plenty of spots in throughout town offering a taste of New Orleans, Angelenos were not without options to celebrate Mardi Gras. Sassafras Saloon in Hollywood was no exception. Aside from their exceptional cocktail offerings, Sassafras went the extra mile and had a tap-takeover by Louisiana's Abita Brewing Company, a crawfish boil (! ), live music from the Mudbug Brass Band, and topped it all off with burlesque dancers. Hundreds of spirited revelers converged on Danny’s for the annual Venice Mardi Gras Parade after party on Feb. 6, 2016. The band was jamming’, drinks were flown’ and the Venice Paparazzi photo booth was rocking’, capturing all the Venetians in their costumed best. It was a party among parties, and surely an event not to be missed. Thank you to Miss Jessica, the Gumbo Brothers, Venice Mardi Gras Krewe, The Mudbug Brass Band. Crawfish bowls, jambalaya, and music by the lively Mudbug Brass Band, are just some of the offerings that Sassafras Saloon will be having to kick off Mardi Gras in Los Angeles. Pasadena will be transformed into a melodic wonderland for the 8th annual Make Music Pasadena Festival on Saturday, June 6, 2015. This year’s lineup is stellar and features more than 150 bands! One of five that can’t be missed is The Mudbug Brass Band: This octet makes spicy music with a funky sousaphone, skronking trombone, and twangy banjo. The 8th Make Music Pasadena festival takes over stages and nontraditional venues across Pasadena this Saturday June 6th 2015 with the New Orleans Second line party purveyors, Mudbug Brass Band hitting the Levitt Pavilion stage at 4:00pm. In addition to our list of great Mardi Gras events in Los Angeles, head to Union Station for a special free jazz concert (part of the Metro Presents Series) by Louisiana-rooted & L.A. based band "The Mudbug Brass Band." Fat Tuesday is upon us and, in keeping with the recent spate of Big Easy-inspired restaurants in Downtown LA, Union Station is hosting The Mudbug Brass Band. This eight piece ensemble will thrill rush-hour commuters and the otherwise jazz curious...No one will be throwing beads and people won't carouse through the concourse with Hurricanes in hand, but they will still enjoy the Mudbug's brassy celebrations of this mortal coil. At Tastemade Studios in Santa Monica, their Mardi Gras event was hopping, packed with people. Music, provided by Mudbug Brass Band, was festive and appropriately loud. "The Mudbug Brass Band will lead a Bourbon Street-worthy dance procession for about a mile as the 14th annual Venice Beach Mardi Gras Parade hits the boardwalk." The Mardi Gras bash being thrown by Tastemade, a video network who raised $25 million in funding last year, seems like a great way to spend part of their marketing budget. Dishes will include Orleans & York, Gumbo Mumbo, Little Jewel's, Jambalaya, and Uncle Darrow’s Mardi Gras pasta, which partygoers can pair with Stillhouse Moonshine Hurricanes or Groundwork Coffee’s cold-brew Sazeracs while grooving to tunes from the Mudbug Brass Band. So you want to experience the jazz and funk of a traditional Mardi Gras but you can’t get out of Los Angeles. Not to worry — Metro Presents is bringing Mardi Gras to you! 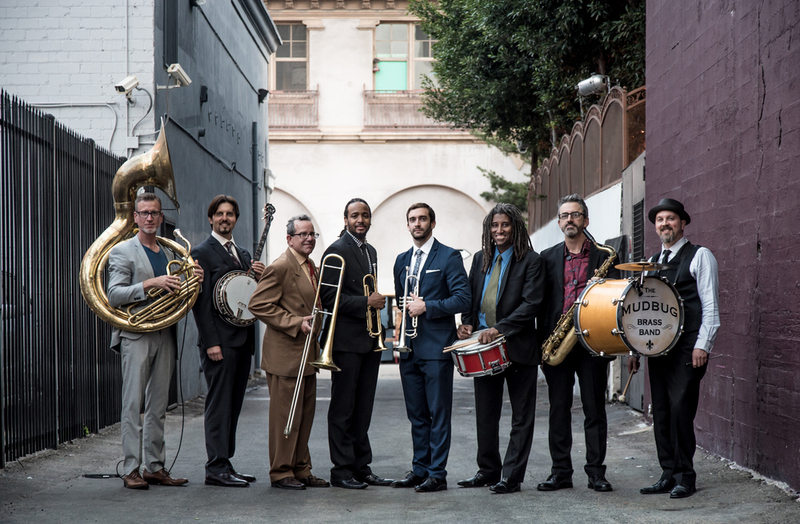 Swing by Union Station on Tuesday, Feb. 17 to check out the Mudbug Brass Band, a Louisiana-rooted but Los Angeles based 8-piece New Orleans Jazz band dedicated to the Second Line tradition. "The Venice Beach Mardi Gras Parade is now in its 14th year and has grown to include The Mudbug Brass Band...No floats, fire trucks, city officials or celebrities in our parades (At least none that I know of), we draw our inspiration from the Mardi Gras Indians." The Mudbugs brought a piece of New Orleans to the Central Coast! It was very important to us to have some of my husband's Cajun heritage in our wedding and the Mudbugs were exactly what we were looking for! They led our Second Line, which was one of the most memorable elements of our wedding...our guests loved it! "The parade had the feeling of a royal procession as the joyous rendition of "When the Saints Go Marching In" was played by The Mudbug Brass Band." "The Mudbug Brass Band blew "Sweet Georgia Brown" as they led the Walk the Talk parade participants from Gladys Park northwest to 5th and Main street." This weeks must-see LA shows include The Mudbug Brass Band at Union Station's 75th Anniversary celebration! "Party like it's 1939: L.A.'s Union Station, turning 75, plans fun that includes The Mudbug Brass Band!" "If you get a chance to see the Mudbug "Brass" Band, seize it with both hands!" "The Mudbug Brass Band was awesome!" "The Foundry on Melrose in West Hollywood has one of the most festive patio atmospheres around! Sure, summer may be running out, but there are plenty of "Mudbugs" left to be found." "I'm at The Foundry & Angelinos are moving to music! Go Mudbug Brass Band!" "The Mudbug Brass Band gives an Authentic Vibe to the Crawfish Boil at The Foundry on Melrose."